Open up and say ahhh! Saving money on your family’s dental care has never been easier! Enjoy immediate access with no waiting periods or forms to fill out. Save between 15%-50% on dental care. Choose from a network of over 80,000 general dentists and specialists. Discounts are not available in AK, MT, ND, SD, VT, WA and WY. Open Up And Say Ahh! As a member, you can visit any participating dentist as often as you like and save 15% to 50% on dental care for you and your family. The dental program includes virtually everything from routine check-ups, to fillings, crowns, braces and even cosmetic work. See the chart above for a sample of typical Aon Dental Solutions fees. * Some services are excluded from the program, and providers are not obligated to charge Members any specific rates for excluded services. *Dental savings are based on Aon Dental Solutions Network's 200 Series Dental Fee Schedule for participating general dentists (fees vary by region) compared to the 2010 National Dental Advisory Service National Average (average savings 34%). Aon Dental Solutions Network's participating specialty dentists provide a discount of 20% off their usual and customary charge (15% for MN specialty dentists). ** Discounted fees are listed for visits to a participating general dentists. Any procedure not covered on the complete fee schedule will be discounted 20% off the provider's usual and customary fee (15% for MN specialty dentists). Consult with your provider prior to beginning any treatment. Lab fees are additional. Walgreens has more than 400 Healthcare Clinic locations nationwide, and most are open 7 days a week, including evenings, too. Members receive 10%* savings on all clinic services. * This discount cannot be used in conjunction with insurance. Whether you have worn hearing aids before or you are new to the process, Connect Hearing can get you on the path to better hearing. From scheduling a free hearing test to choosing and maintaining your hearing aids, we’re with you every step of the way. 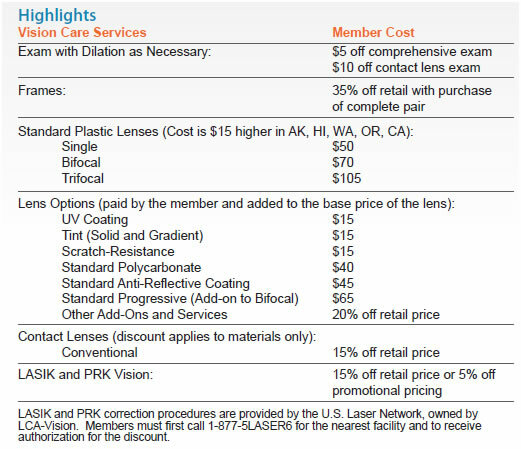 Save 35% off normal retail prices on frames (complete pair) and 20% off lenses and lens add-ons. Visit participating retailers such as LensCrafters, EyeMasters, Pearle Vision and other independent vision providers! In all, there are more than 45,000 providers in over 21,000 locations to choose from. Prescription Drug Prices Hard to Swallow? You will now save an average of 31% off the retail price of generic drugs and 15% off the retail price on brand name drugs at retail pharmacies. Simply take your prescription into any of the more than 65,000 participating pharmacies nationwide. * Average savings in no way guarantee local market pricing, savings or availability at time of purchase. Average savings are based on a 30 day supply of frequently purchased prescriptions, nationwide, as averaged over a 6 month period. ** ** 6 month period reported was September 2011 - February 2012, the most current data available at the time of this report. Now YOU Have The Power! This program provides access to discounted lab work - without a prescription! The savings range from 20% to 70% off retail billed charges.Discounts not available in MD. Lab tests are available in NY, NJ, MA & RI for Wellness and STD testing only. Disclosures: The discount medical, health, and drug benefits of this Plan (The Plan) are NOT insurance, a health insurance policy, a Medicare Prescription Drug Plan or a qualified health plan under the Affordable Care Act. The Plan provides discounts for certain medical services, pharmaceutical supplies, prescription drugs or medical equipment and supplies offered by providers who have agreed to participate in The Plan. The range of discounts for medical, pharmacy or ancillary services offered under The Plan will vary depending on the type of provider and products or services received. The Plan does not make and is prohibited from making members’ payments to providers for products or services received under The Plan. The Plan member is required and obligated to pay for all discounted prescription drugs, medical and pharmaceutical supplies, services and equipment received under The Plan, but will receive a discount on certain identified medical, pharmaceutical supplies, prescription drugs, medical equipment and supplies from providers in The Plan. The Discount Medical Plan Organization is Alliance HealthCard of Florida, Inc., P.O. Box 630858, Irving, TX 75063. You may call 800-565-3827 for more information or visit the provider link for a list of providers. The Plan will make available before purchase and upon request, a list of program providers and the providers’ city, state and specialty, located in the member’s service area. The fees for The Plan are specified in the membership agreement. The Plan includes a 30-day cancellation provision. Note to MA consumers: The plan is not insurance coverage and does not meet the minimum creditable coverage requirements under M.G.L. c. 111M and 956 CMR 5.00. Not available in AK, MT, ND, SD, UT, VT, WA, WY Coming soon in OK. Medical discounts provided by Alliance HealthCard of Florida, Inc.